I was recently invited to my very first craft night at the lovely Julie's place. 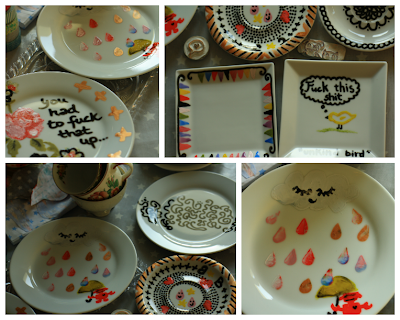 She had found some ceramic plates that someone had thrown away (!! ), so we started the evening by painting them. I'd never painted ceramic before and I'm really crap at drawing or paiting anything so I was a bit apprehensive, but the little plates turned out very cute! At least now I have a couple of white(ish) plates for food photography... our black and grey plates really are not at all suitable for taking nice food photos. Besides the ceramic painting Julie had sewn these little Berlin TV towers, so I filled some of them to take home with me. So cute! And she had a gazillion rolls of washi tape which just had to be used for something, so I made some gift tags. Or a lot. But I'll make a new post of them, because they deserve a post of their own.